April 19, 2012 – PRESS SUMMARY – Tenba has introduced two new bags to their popular Roadie II collection. The Roadie Video Backpack and Shoulder Bag were designed from the ground up with video gear in mind. They will fit the latest digital camera / video systems, including DSLRs from Canon (5D Mark III, EOS-1D X) and Nikon (D4, D800), and larger gear from RED (Epic, Scarlet), Canon (C300) and Sony, along with a laptop and a full assortment of accessories. Tenba consulted with a wide range of videographers to ensure that the new Roadie video bags would meet their needs for protection, speed, durability and comfort. Video-specific features are found throughout the bags, such as tall monopod/shotgun mic pockets, quick-access audio compartments, padded integrated laptop storage, wide, unobstructed openings, oversized pockets for large batteries, hard drives and cables, and much more. Built to the same “Crafted Without Compromise” level as Tenba’s existing Roadie cases, the new video bags have the look and performance of distinctive travel cases, with rugged, water-repellant ballistic nylon exteriors, genuine YKK zippers, waterproof bottom panels and industrial/military-grade webbing. 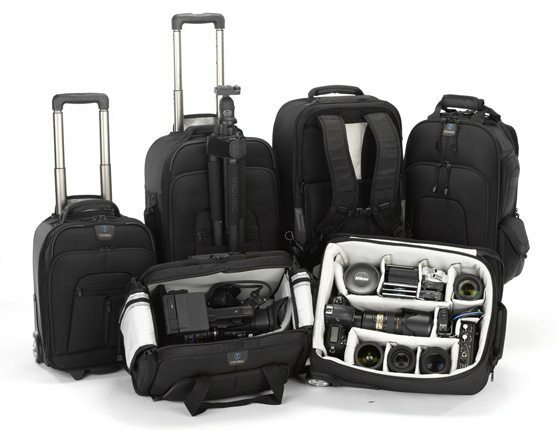 Each bag includes padded dividers systems that will adjust to fit drastically different camera systems, from larger video cameras like the RED Epic and Canon C300, to smaller DSLR systems from Canon, Nikon and Sony. Both bags include Tenba’s exclusive WeatherWrap removable rain cover, plus a slim 10-pocket media wallet that fits either CF or SD cards. The Roadie II Video Backpack and Shoulder Bag will be available by June 1st at suggested retail prices of $299.95 and $279.95 respectively. To find more information about Roadies, and to see a full video demonstration of all Tenba products, visit www.tenba.com.